Preheat oven to 350°. Cut the butternut squash in half lengthwise and scoop out the seeds. Place butternut squash, cut side down on a sheet pan. Place in the oven and add water to the cookie sheet until it comes 1/4 of the way up the squash. Bake the squash until fork tender, about an hour. When the squash is tender, remove from the oven and flip squash over to cool; empty any excess water and throw out. When the squash is cool, scrape the squash from the skin, place in a food processor and puree until it resembles a fine puree. You should have about 1/2 gallon squash puree. Place the puree into a heavy bottomed sauce pot and add water. Place over medium heat, stirring often with a whisk, until soup just begins to boil, turn heat to low and simmer for 5 minutes. Add the cream, butter, salt, pepper and honey to taste. 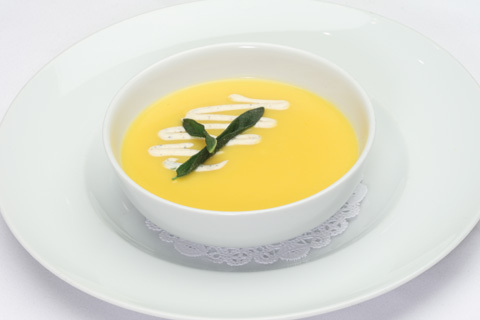 To serve, ladle the soup into a warm soup bowl, drizzle one Tablespoon of the spice cream over the top and garnish with 2 fried sage leaves. Combine all ingredients in a small bowl and mix well. Keep cold until needed. In a small sauce pot, heat the canola oil over medium heat. Attach a deep fryer thermometer. Line a sheet pan with paper towels. When the oil reaches 350° add the sage leaves and gently stir around with a slotted spoon. After about 10 seconds remove to the sheet pan lined with paper towels and season with salt. Set aside until needed.